(b. 1961) – a Ukrainian poet, writer and literary critic; one of the most outstanding figures of Ukrainian literature. He was the first writer who received the Taras Shevchenko National Award (2004). He is a veteran of the Afghan War, where he was wounded – this theme recurs very often in his works. He debuted with a volume Як довго ця війна тривала [How Long This War Lasted] at the end of the 1980s. 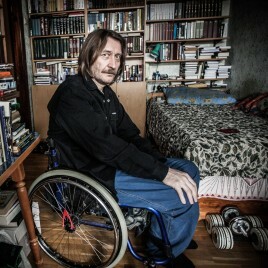 His other two books – controversial and bold Woman Made of Snow (2012) and The Book of Oblivion (2014), which is a sort of conclusion of the Afghan motif in the author's works – have been translated into Polish.